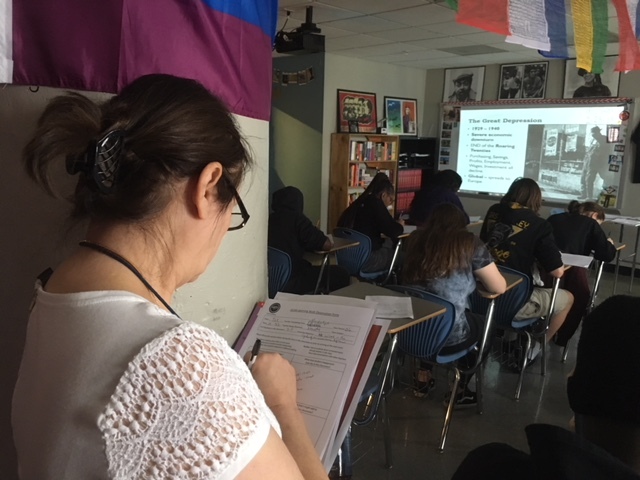 Diana Rudolph middle school teacher, quietly took notes on high school history teacher, Evan Smiths incorporative teaching style; While students followed along in Smiths lesson taking notes and shouting out opinions. Wes Smith, choir director, Tracy Mense, history and psychology teacher, Nelson Pardino, Spanish teacher, and Nick Rhodes, student teacher, speak to Kathleen Boesch about her creative process with her artwork. Taken while observing Megan Clayton, visual art teacher, during her AP studio art and AP independent study classes. 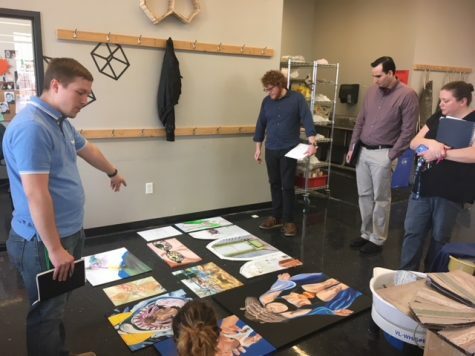 Teachers and administrators came together in March to observe one another’s classes and gain a new perspective about the inner workings of different classes. Educators all around the school participated in these observations. Teachers were given papers that included boxes to state positive and helpful things they recognized in each classroom, and to also note what they might want to add to their own classes. Part of the goal of the observations was to point out what “PBIS” – or “positive behavioral interventions and supports” – the teachers see around other classrooms, in teacher’s lessons, or even between students. “If I see positive things, I know…what I want to add to my own classroom,” said Courtney Young, instructional coach. After visiting three classes, teachers sat and discussed not only what was positive about the experience, but what they did not expect from each class. “Ms. Collins had sixth graders, and so I’ve never had any of those students, obviously, but they were all really well behaved. I think the middle schoolers have their own problems, but I think it really depends on the teacher. So, I think if you have a good strong teacher like Ms. Collins, I don’t think the middle schoolers are a big deal, and I think if you have a teacher who maybe can’t handle the middle schoolers or isn’t good with discipline then that’s…where all the bad images of middle schoolers come from.” Michael Mancuso, high school math teacher, said. A few teachers have started picking out strategies for their own classes, such as Nelson Pardino, Spanish teacher, who observed Denise Pranger, middle school teacher, and her use of technology. 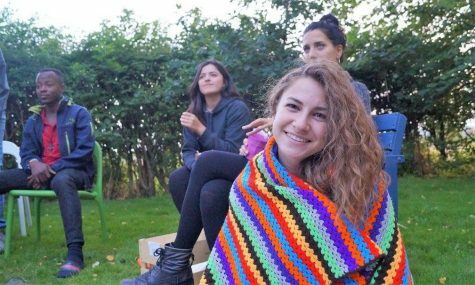 “She was using technology a lot, it was a very structured class…she had a great use of technology, kids were engaged.” Pardino said. This experience has given Pardino, like many other teachers throughout the school, a chance to expand his teaching skills. “Because I only see the art kids, I never get to see them shine in their academic courses. So it’s kind of nice to see that academic side of students, and also to engage in serious discussions…when teachers come in and observe you, I think it’s an affirmation of what you yourself are doing in the classroom. This is important…I wish we would do it more, it’s really a way to build a community,” Liz LeSaulnier, visual arts teacher, said. Some teachers have critiques for the observational tour itself. “I feel that it’s helpful but I wouldn’t want to do it too often, simply because it’s one thing to learn a new skill, it’s another thing to learn fifteen new skills and not have time to work on implementing (them)…but yes, I do feel like it was…beneficial.” Thomas Proctor, dance teacher and choreographer, said. “Over fifty teachers on staff”, Young said, as well as counselors and administration, participated in this observational tour. “About 80% of the teachers (participated),” Young said. Even though not every teacher could transfer strategies from other classrooms into theirs, they still got to experience their colleagues teaching a subject they might not get to see too often, as well as observing their own students in a different setting. “It’s something many teachers have been saying – when you start to see students in all their classes, you see them differently.” Pardino said.